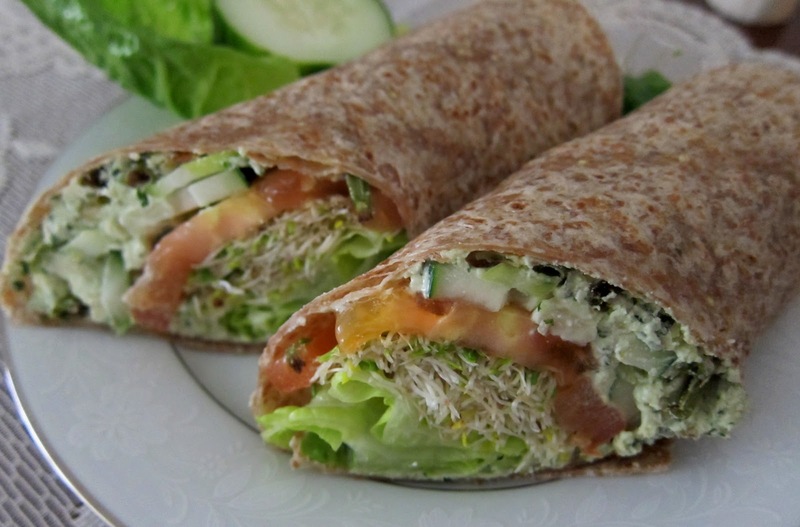 I am obsessed with wraps lately...there is something summery about them, and since I am not a huge sandwich bread fan, they replace the bread in my sandwiches much of the time. I especially like the sprouted grain varieties, they are wonderfully nutty and flavorful...the perfect package for veggies and wonderful spreads such as hummus and pesto! Wraps are just what I had in mind for tonight's dinner, and I had some chevre in my fridge, and I thought it might make a nice spread livened up with some herbs and garlic and a bit of nuts of some sort. So I threw in some basil and mint as well as some lemon and pine nuts and buzzed it up in the food processor. The spread turned out pretty tasty! I decided that it would go nicely with some roasted garlic scapes as well as some tomatoes and cucumbers, since it is warm out and those are cooling veggies. 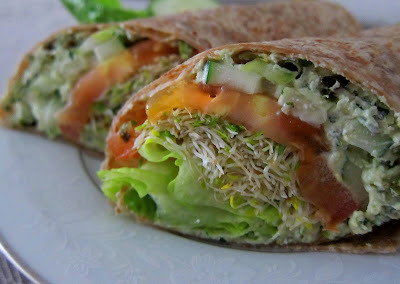 Sprouts and lettuce were a required addition to this wrap as well since I love both of them! The wraps turned out wonderfully, full of flavor and very satisfying! Try these out instead of the usual bread for a light summer meal! In a food processor, combine all spread ingredients and process until smooth, then set aside in the fridge. Heat oven to 475 degrees, and line a baking sheet with foil. Toss scapes with just enough oil to lightly coat, and spread out on sheet. Roast for about 10-15 minutes or until starting to brown. Remove from oven and let cool to room temp. To assemble wraps, lay out tortillas, and spread the chevre mixture on the upper half of each. Top with the scapes, dividing evenly between the two. Then top with the cucumbers and tomatoes, then the sprouts and romaine. Roll up from the top down, then cut in half on the diagonal. Amy...I want to eat this out of the monitor...so healthy and I love wraps too especially like yours. Thanks for sharing. You have reminded me that I should eat halthy too :) Thanks! Great wrap. I love goat cheese. these look mouth watering and delightful! I love garlic scapes, wraps, goat cheese...ok I love all of this!! !